Will Siddaramaiah need a plan B? As a north Indian driving through south Karnataka, I am struck by how clean and uncluttered it is. We make our way past grape farms and coconut palms on roads that are as soft as butter, even in the most interior and remote villages. We are traveling in a territory dominated by the Janata Dal Secular [JD(S)], former prime minister H.D. Deve Gowda’s party. The fields are ablaze; the summer temperatures and the political weather make for some heated arguments under the watchful and menacing eye of the dhristi bommai, the talisman that is the local equivalent of a scarecrow and is meant to ward off evil. Banging his hand on the podium more than once, 84-year-old Gowda seems more sprightly and animated than his prime ministerial years, when he was sometimes caught on camera drooping off at meetings. While he is speaking, one of his supporters whispers a confession to me: “No one knows what the result will be.” The JD(S) is doing better than expected, mostly because of Vokkaliga consolidation triggered by one of Chief Minister Siddaramaiah’s most contentious decisions—the recommendation that the Lingayat community be recognised as a separate religious minority. The Congress still calculates that Siddaramaiah’s Ahinda formula—a rainbow alliance of dalits, backward classes, Muslims and adivasis—can contain any backlash. But, no one denies that the JD(S) has suddenly occupied more space in the political imagination than was anticipated. At another small town, his party workers are a little more candid. Standing atop a jeep where Mayawati posters now share space with that of Gowda and Kumaraswamy, they say whether or not to take help from the BJP would be “Deve Gowda’s decision”. I push them further. What if BJP state president B.S. Yeddyurappa is a claimant for the chief minister’s post; would the JD(S) be willing to fill the gap in numbers? “No, no, no,”—a hysterical chant erupts among the men. It is quite clear that the party’s base does not see itself as mere kingmakers; “We are the kings,” says one supporter. 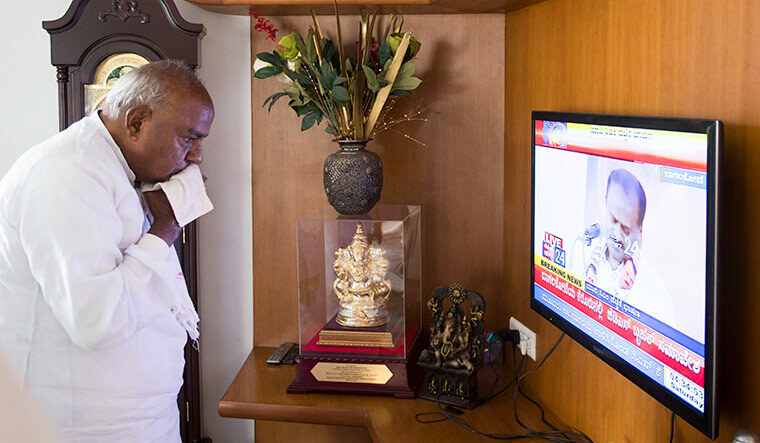 Not many are convinced about Gowda’s disavowal of the BJP. Local journalist and writer K.N. Nagesh reminds us that the “same drama was enacted” in 2006, when Kumaraswamy rebelled against his father to form a coalition with the BJP. “Later, they will meet in some temple and make up,” he says wryly, indicating that the father and son are keeping two parallel options open. On the way back to Bengaluru, we unexpectedly run into voluble supporters of Prime Minister Narendra Modi, even though the entire belt votes for either the JD(S) or the Congress. We talk to them about whether the BJP’s kid-glove treatment of the Reddy brothers, the mining barons charged with grave violations of law, will tarnish their image. The young men just laugh. “Corruption is not an issue in these elections. Everyone knows that without the help of the Ballari brothers, Yeddyurappa would not have risen to where he has,” they say. Siddaramaiah, meanwhile, has managed to hold his nerve and not betray any obvious signs of nervousness despite poll after poll forecasting that, while the Congress will be the party with the single largest tally, it could fall victim to the agile machinations of the BJP and Kumaraswamy. A close aide of the chief minister says their own dipstick tests maintain that the incumbent will cross the 100-seat threshold. “But what is plan B?” I persist. At first, his core team only says, “The chief minister won’t hear of it.” Then, one aide quietly talks of a channel open to H.D. Revanna, Deve Gowda’s elder son. “He is close to the chief minister and we have been helping him, too,” says the aide, sharing how there is open intrigue in the family. The Congress is banking on a simmering family feud to cross the finishing line, if needed. Tickets were denied to Revanna’s wife, Bhavani, and son, Prajwal, in these elections. Last year, Prajwal openly clashed with his grandfather. Banking on these fault lines to wrench open a divided family may be Siddaramaiah’s fallback option.